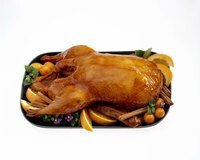 Duck a l'orange is a French dish that has reached the status of classic. The interplay of the tart citrus with the rich duck meat is a flavor combination that is hard to improve upon. Matching a dessert with this main dish for menu planning purposes is not difficult -- French cuisine abounds with excellent complementary desserts. Feel free to echo the citrus notes of the orange sauce in the final course but don't feel bound to only orange notes -- lemon and grapefruit desserts would also play well with this dish. The simplest dessert option after a meal of duck a l'orange is a platter of sliced citrus fruit. You can separate oranges and grapefruit into segments -- a technique called supreming -- or you can carve the peel off the citrus and then slice it into thin rounds. Offer a bowl of pistachios alongside or scatter the nuts on top for a heartier final course, or simply garnish with thinly sliced mint leaves. Orange pairs winningly with chocolate, so a chocolate dessert is always apropos after duck a l'orange. Chocolate mousse has a delicately creamy texture and a rich mouthfeel. If you want to continue the citrus theme of the meal into dessert, you can add some orange liqueur to the mousse. A chocolate pot de creme is another option. Olive oil cakes are moist, not too sweet and often flavored with orange, lemon or grapefruit, echoing the citrus notes of the duck main course. They are also very easy to make. Some versions are made with almond flour rather than white flour, adding another subtle flavor note. You could also experiment with herbs such as rosemary in the mix. Serve with a dollop of creme fraiche or a sprinkling of powdered sugar. A scoop of homemade citrus sorbet is a pleasant way to end an elegant dinner. The cold of the dessert cuts through the richness of the main dish while the citrus flavors tie the meal together as a whole. You can add a splash of Champagne, or a liqueur such as Campari or Grand Marnier here. Or try incorporating some mint, lavender, basil or chopped candied citrus peel. A granita or sherbert would work well here, too.